Gboarduk is proud to offer the first of 12 hand-built gboards. All built by the inventor and all with their own unique characteristics. This urban-style board, marked B001 is the 1st. 12 years of design trials and practise have finally come together to define this self-contained extreme sports environment. The apparatus comprises of a drainpipe black 6-piece steel tube frame, red gboarduk webbing with buckles and safety hand-holds and a concave, convex, double-sided, flexible composite board, designed by gboarders. This is the 1st of it's kind, so don't miss out on this truly unique opportunity. 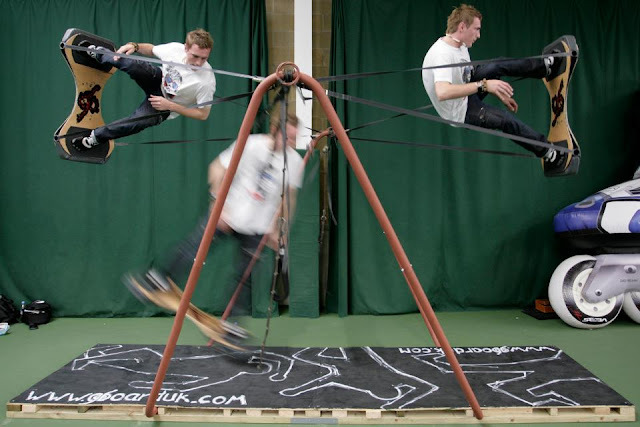 see the prototype in action from Skate London 2011!